The Cristallo Chandelier possesses great design and great quality throughout at a fraction of the cost of comparable fixtures made of Murano Glass or Crystal!! The Cristallo Chandelier comes with 234 individual crystal hooks which are placed over 3 individual tiers once you install the fixture. Inside the light illuminates from 3 individual sockets with a max 60W each for a total of 180W on this fixture! 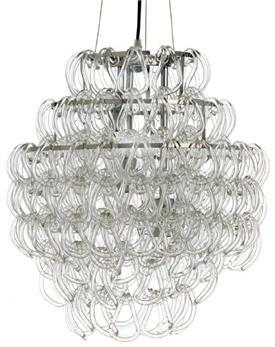 A silver canopy is supplied along with 72" of clear cord to hang the fixture at your desired height. Designed to be hard wired. Light Assembly required. Uses (3) 60W max E26 bulbs (INCLUDED!). This fixture is hard wired and comes with 72" of clear cord and stainless cable to hang (hard wired) and canopy. Assembly instructions included. 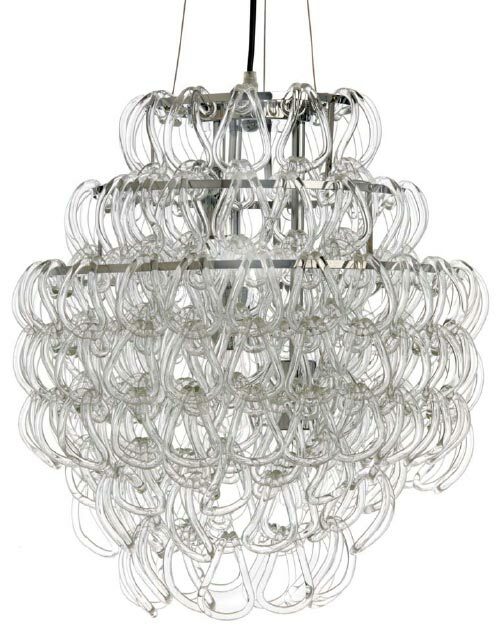 HUGE 23" x 18" Cristallo Chandelier - 234 Individual Crystal Hooks Joined together to form this Designer Fixture - Compared to only 150 Glass Hooks on Giogali fixture designed by Angelo Mangiarotti! !